Bio-Trauma 911, Inc. works with biohazard remediation companies throughout the United States. Through this partnership, we may be able to provide Crime & Trauma Scene Remediation Services to businesses and residents of the State of Illinois. If you are located in any of the following or surrounding cities, please contact us at 1-800-759-6960 to see if we have technicians in your area. Bio-Trauma 911, Inc. offers a wide variety of services to both individuals and companies throughout Illinois and most of the United States. Available 24 hours a day, seven days a week, our technicians offer our clients a viable means of relieving some of the pain and anguish suffered as a result of a traumatic event. Bio-Trauma 911, Inc. and networkPRIDE work with many different insurance companies and are often able to bill your insurance company directly. If insurance covers the cost of our services, the only payment required from you will be your policy deductible. 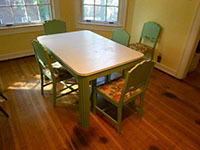 If insurance coverage is not available, we do offer several different payment plans, which generally suit most budgets. Since 1995, the caring and compassionate staff of Bio-Trauma 911, Inc. has been insturmental in helping hundreds of hoarders throughout the Midwestern United States. Through our office in the State of Indiana, Bio-Trauma 911 can offer you or your family member(s) professional and cost effective hoarding cleanup services. 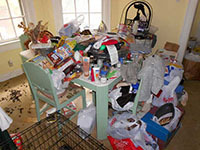 Our hoarding and clutter cleaning services are offered to residents in and around the following cities: Chicago, Aurora, Rockford, Joliet, Naperville, Springfield, Peoria, Elgin, Waukegan, Cicero, Champaign, Bloomington, Decatur, Arlington Heights, Evanston, Schaumburg, Bolingbrook, Palatine, Skokie and Des Plaines. Please feel free to call us at 1-800-759-6960 to see if we service your area.